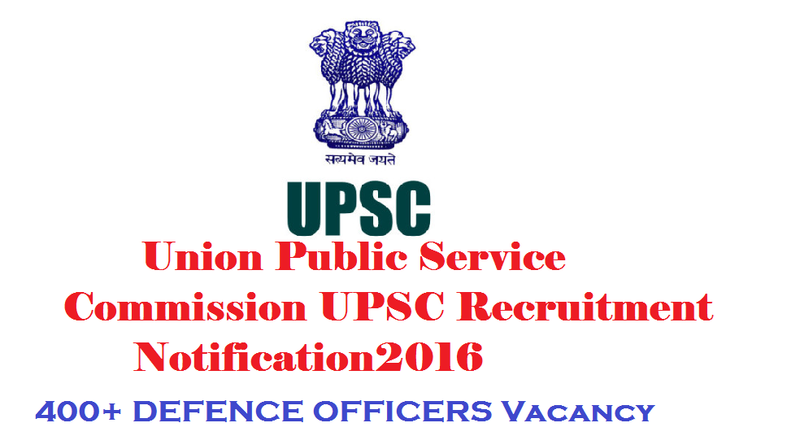 On 16 July 2016, Union Public Service Commission (UPSC) has come up with a recruitment notification to recruit for ” Combined Defence Services Examination (II) ” post. Through this recruitment notification, Union Public Service Commission (UPSC) Desires to hire candidates who have completed M.A/Any Graduation for the post of ” Combined Defence Services Examination (II) “. Union Public Service Commission (UPSC) is planning to recruit 413 candidates for the post of ” Combined Defence Services Examination (II) “. Interested and eligible candidates can apply before 12/08/2016. Address For The Job : Union Public Service Commission (UPSC), Across India . Candidates can Get the Combined Defence Services Examination (II) Post details such as Job Description, Number of vacancy, Qualification, Age limit, Eligibility and etc., from the table given below. Department : Indian Military Academy, Dehradun— 150 143rd Course commencing in July, 2017 [Including 19 vacancies reserved for NCC ‘C’ Certificate (Army Wing) holders]. 2. Indian Naval Academy, Ezhimala—Course 45 commencing in July, 2017 Executive (General Service) [including 06 vacancies reserved for NCC ‘C’ Certificate holders (Naval Wing)]. 3. Air Force Academy, Hyderabad—(Pre-Flying) 32 Training Course commencing in July, 2017 i.e. No. 202/16F/PC. 4. Officers’ Training Academy, Chennai—106th 175 SSC Course (for Men) commencing in October, 2017. 5. Officers Training Academy, Chennai—20th 11 SSC Women (Non-Technical) Course commencing in October, 2017. Education required: (i) For I.M.A. and Officers’ Training Academy— Degree of a recognised University or equivalent. (ii) For Indian Naval Academy—Degree in Engineering from a recognised University/Institution. (iii) For Air Force Academy—Degree of a recognised University (with Physics and Mathematics at 10+2 level) or Bachelor of Engineering. Graduates with first choice as Army/Navy/Air Force are to submit proof of graduation provisional certificates on the date of commencement of the SSB Interview at the SSB. Pay Scale: Rs. 40,000/- to Rs. 50,000/- per month consolidated pay (based on credentials). Free accommodation will be provided on campus. Age Limit: 20 to 24 years as on 1st July 2017 i.e. born not earlier than 02nd July, 1993 and not later than 01st July, 1997 (Upper age limit for candidates holding valid and current Commercial Pilot Licence issued by DGCA (India) is relaxable upto 26 yrs. i.e. born not earlier than 02 nd July, 1991 and not later than 01st July, 1997) only are eligible. Application Fee For The Job: Candidates (excepting Female/SC/ST candidates who are exempted from payment of fee) are required to pay a fee of Rs. 200/- (Rupees Two Hundred Only) either by depositing the money in any Branch of SBI by cash, or by using net banking facility of SBI, State Bank of Bikaner & Jaipur/State Bank of Hyderabad/State Bank of Mysore/State Bank of Patiala/State Bank of Travancore or by using Visa/Master Credit/Debit Card. Candidates are required to apply Online using the link www.upsconline.nic.in Detailed instructions for filling up Online Applications are available on the abovementioned website. The applicants are advised to submit only single application; however if due to any unavoidable situation, if he/she submits another/multiple applications, then he/she must ensure that application with the higher RID (Registration ID) is complete in all respects like applicants’ details, examination centre, photograph, signature, fee etc. The applicants who are submitting multiple applications should note that only the applications with higher RID (Registration ID) shall be entertained by the Commission and fee paid against one RID shall not be adjusted against any other RID. All candidates whether already in Government Service including candidates serving in the Armed Forces, Government owned industrial undertakings or other similar organizations or in private employment should submit their applications online direct to the Commission. N.B.I: Persons already in Government Service, whether in permanent or temporary capacity or as work charged employees other than casual or daily rated employees or those serving under the Public Enterprises are, however, required to inform their Head of Office/Department in writing that they have applied for the Examination. N.B.II: Candidates serving in the Armed Forces are required to inform their Commanding Officer in writing that they have applied for this examination. They are also required to submit NOC in this regard at the time of SSB interview. Candidates should note that in case a communication is received from their employer by the Commission withholding permission to the candidates applying for/appearing at the examination, their applications will be liable to be rejected/candidatures will be liable to be cancelled. NOTE : APPLICATIONS WITHOUT THE PRESCRIBED FEE (UNLESS REMISSION OF FEE IS CLAIMED AS IN PARA 4 ABOVE) OR INCOMPLETE APPLICATIONS SHALL BE SUMMARILY REJECTED. No representation or correspondence regarding such rejection shall be entertained under any circumstances. Candidates are not required to submit alongwith their applications any certificate in support of their claims regarding age, educational qualifications, Scheduled Caste/Scheduled Tribe/OBC and fee remission etc.